Classical work and recent progress on the precise semantics of OO modeling. Progress in academic research and ``technology transfer'' of this research. Industrial experience with precise specifications. Tool support for precise semantics. The Proceedings will be available at the Workshop. The Table of Contents and Index are now available. Haim Kilov is a Chief Architect, Business Modeling, at Financial Systems Architects. He has been involved in all stages of information system specification, design, and development. His approach to information modeling, widely used in financial, insurance, telecommunications, document management, and other areas, especially for business specifications, has brought demonstrable clarity and understandability to specifying (components of) businesses and systems. It has been described in two of his books published by Prentice-Hall in 1994 and 1999 and in a significant number of other publications. His new book is forthcoming in 2002. He has also co-edited two books on behavioral semantics of businesses and systems for Kluwer Academic Publishers. He has been the cochair and proceedings editor for all OOPSLA and ECOOP workshops on behavioral semantics and has been a speaker, tutorial presenter and program committee member for many international conferences. He is a subject area editor of Computer Standards and Interfaces. He substantially contributed to several international standards on Open Distributed Processing and to the work of various OMG working groups and task forces. 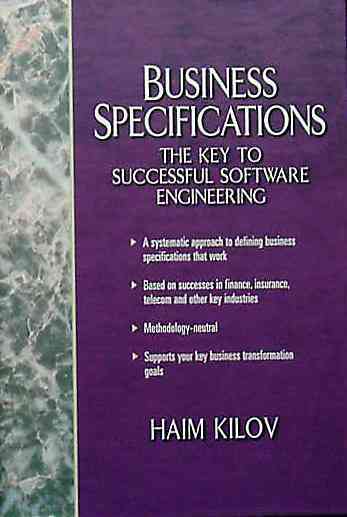 Haim Kilov is using and extending his approach to specifications in customer engagements, and does research and consulting in the areas of business specifications and information modeling. He has been affiliated with Iona Technologies, Bellcore, IBM, and the Technology Strategy and Planning Department of Merrill Lynch. Kenneth Baclawski is an Associate Professor of Computer Science at Northeastern University. He has a B.S. from the University of Wisconsin and a Ph.D. from Harvard University. Prof. Baclawski's research interests include Formal Methods in Software Engineering, High Performance Knowledge Management, and Database Management. He teaches a variety of courses in Software Engineering, Object-Oriented Systems, Databases, Data Modeling and Operating Systems. He has participated in and directed many large research projects funded by government agencies including the NSF, DARPA and the NIH. He is a cofounder of Jarg Corporation which builds Internet-based, high performance knowledge management engines. Prof. Baclawski has published over 30 articles in major research journals. He has also published extensively in conference and workshop proceedings. He holds two U.S. patents and has 6 pending patents. Prof. Baclawski is a member of the ACM and the IEEE. He has held many positions in both organizations, including President of the Boston Chapter of the ACM. The continuing theme of the OOPSLA Workshop Series on Behavioral Semantics is to foster precise and explicit OO specifications of business and system semantics. The specific emphasis this year -- the eleventh year of the Workshop -- is on serving the customer. Many decision makers in the business technology field recently stressed that the trust and the patience of our customers have been exhausted due to poor quality of our products and services and mismatched expectations. In order to serve customers, we need to understand their needs. However, business and IT organizations often express themselves in very different ways. In order to create information management systems that serve the needs of complex, non-trivial and rapidly changing businesses, effective communication is imperative. In order to communicate effectively, a small collection of shared, clearly defined concepts and constructs with clearly defined semantics is essential. These concepts and constructs -- basic patterns of reasoning -- facilitate understanding and therefore bridge the gap between business and IT. They ought to be used as a basis of all kinds of specifications, such as of traditional businesses and of middleware artifacts. A small, well-structured collection of basic elegant concepts and constructs has been around in programming and modeling for decades. Some have been used in other areas of human endeavor, like engineering, business and law. This collection of concepts was described in an international (ISO) standard, the Reference Model of Open Distributed Processing (RM-ODP). The approach of concept reuse is not unique to OO or even to information technology. For example, ordinary businesses in the US use the Uniform Commercial Code not only as a set of reusable patterns of reasoning and acting, but also as a law. The basic patterns of reasoning are much more stable than technological artifacts -- languages, methodologies and tools -- used to represent them. Therefore such technological artifacts as various versions of UML and XML ought to be assessed from the viewpoint of their support (or otherwise) of the semantics of the concepts and constructs which have to be represented using these artifacts. As in all the workshops in this series, it is our goal to be a focal point of bringing together theoreticians and practitioners to report their experience with making semantics precise, clear, concise and explicit in (OO) business specifications, business designs, and system specifications. We invite papers varying from academic research (especially dealing with transferring theory into practice) to industrial ``war stories.'' This year there is an emphasis on revisiting the classics both to ``set the record straight'' and to recapture insights and ideas that might otherwise slip into oblivion. Open Distributed Processing - Reference Model: Part 2: Foundations (IS 10746-2 / ITU-T Recommendation X.902, 1995). 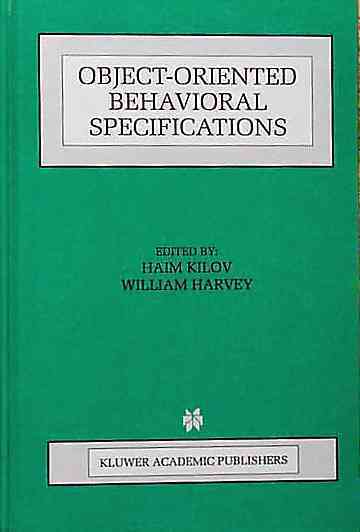 H.Kilov and W.Harvey (Eds.). Object-oriented behavioral specifications. Kluwer Academic Publishers, 1996. 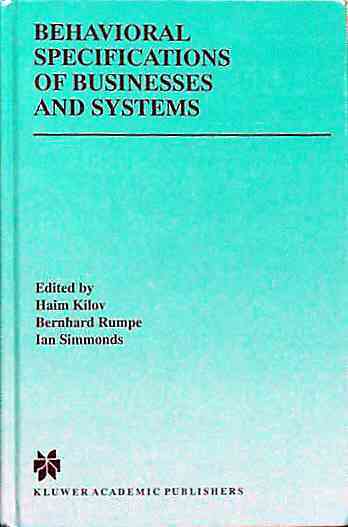 H.Kilov, B.Rumpe, I.Simmonds (Eds.). Behavioral specifications of businesses and systems. Kluwer Academic Publishers, 1999. K.Baclawski, H.Kilov, A.Thalassinidis, K.Tyson (Eds.). Proceedings of the Eighth OOPSLA Workshop on behavioral semantics (Denver, 1999). Northeastern University, 1999. H.Kilov. Business specifications. Prentice-Hall, 1999. K.Baclawski, H.Kilov (Eds.). 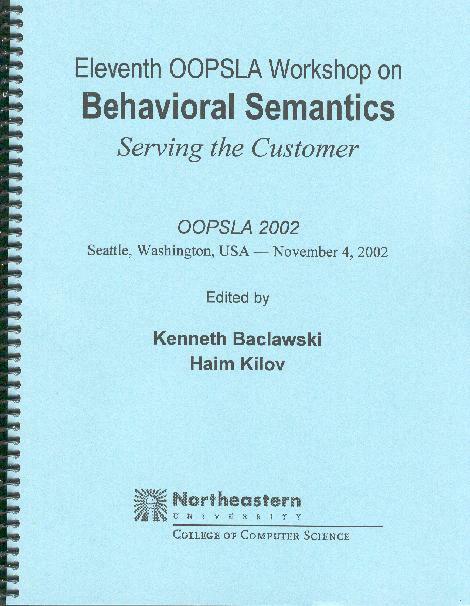 Proceedings of the Ninth OOPSLA Workshop on behavioral semantics (Minneapolis, 2000). Northeastern University, 2000. K.Baclawski, H.Kilov (Eds.). Proceedings of the Tenth OOPSLA Workshop on behavioral semantics (Tampa Bay, 2001). Northeastern University, 2001.
the invitation to submit will be posted in various newsgroups and mailing lists. Invitations will also be emailed to past participants in this workshop series. Submitted papers (5-10 pages) will be reviewed by the organizers. The accepted papers, after rework by the authors, will be published, again as usual, in the Workshop Proceedings. These Proceedings will be distributed before the workshop. Ordinary (transparency) projector, 2 flipcharts.